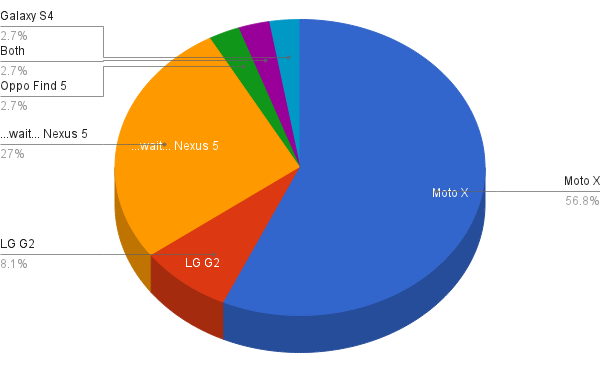 So, last week +Tom Gray really couldn't decide between the LG G2 and the Motorola Moto X. And being who I am, and loving my data... I put his decision in your hands. Although, probably not literally. We talked about it during our Friday Night Hangout... and Tom is already agreeing with you. Let's see how you answered. The original poll was for just the Moto X and the G2, but it looks like a lot of you want this fabled Nexus 5... we'll just have to wait and see about that device. In the interim, it looks like Tom's going to be looking into his new Moto X.